In early 2018, the Archives of Latvian Folklore launched a new initiative—the Autobiography Collection with the aim of preserving and documenting the tradition of life writing of people living in Latvia. The Autobiography Collection is made up of materials people have written during various periods to document their own lives and the times in which they live. Mostly these are diaries, written life stories, memoirs, and letters, as well as various other materials providing complementary information—photographs, interviews with the authors, and their relatives’ stories about them. The Autobiography Collection of the Archives of Latvian Folklore continues to grow actively. Anyone with a connection to Latvia is invited to submit materials, which can be done by contacting the collection curators. If the author/owner of the autobiographical material wants to keep the original, the material can be digitised at the Archives of Latvian Folklore, or at some other agreed-upon location. Once the materials have been digitised, they are returned to the owner. On June 16–21, the International Folklore Festival Baltica will take place in Latvia. The festival is a co–project of the three Baltic States. Festival, which brings together ethnographic ensembles, folklore groups, folk music groups, narrators, craftsmen and individual performers, happens every year, switching location between Latvia, Lithuania, and Estonia. The theme for this year is The Solstice. Blossoming (http://www.festivalbaltica.com). The first Baltica Festival took place in 1987, but in Latvia a year later – in 1988. 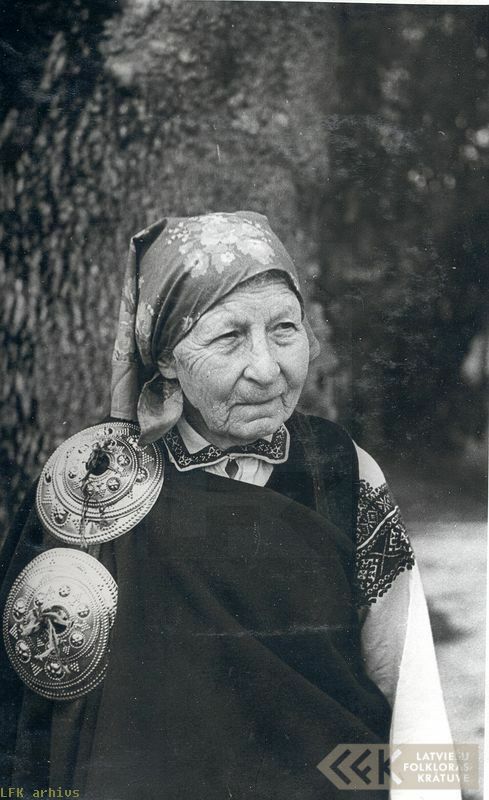 Archives of Latvian folklore hold unique photos from the very first year of the festival in Latvia. Explore them here in the collection of Vaira Strautniece LFK . Collection of the phonograph recordings (1926-1947) of the Archives of Latvian Folklore has been included in the UNESCO Memory of the World Latvian National Register. In April 1926, two years after the foundation of the Archives of Latvian Folklore (ALF), the first Edison phonograph was purchased. In September of the same year, two more phonographs were acquired, both Excelsior models manufactured in Cologne, Germany. The first phonograph recordings were made in 1926 by Anna Bērzkalne, the first Head of the ALF. The last recordings were completed during the field work session of the Folklore Institute carried out from June to September of 1947 in eastern Latvia. This was the last occasion when phonograph recordings were used by ALF. A selection of almost 5000 audio recordings of Archives of Latvian Folklore are made available online! Visit audio section to explore unique sounds, mainly folk songs and various stories, from all over Latvia and outside. 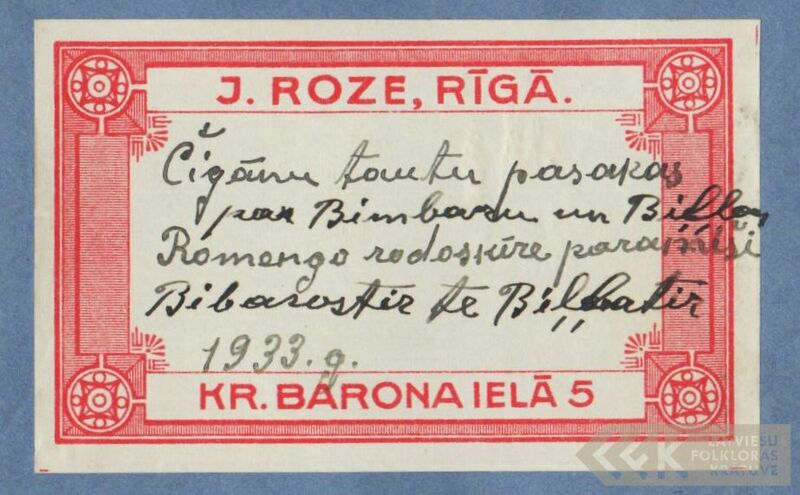 The collection of Liepāja Institute of Pedagogy, LFK , contains bright examples of Soviet folklore, collected in Alsunga parish in 1955, whereas folklore collections of Miķelis Zvirbulis , Milda Rolmane  and Alvīne Ģeistaute  include folklore materials, collected in Rucava parish during the interwar period. 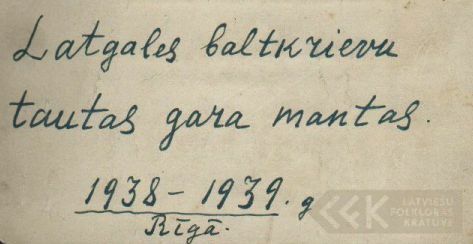 Workshop on folklore collections of national minorities of Latvia held by Archives of Latvian Folklore will take place on Friday, April 10 in National Library of Latvia (Mūkusalas street 3, Riga). In the workshop, the folklore collections of Latvian Belarus, German, Russian, Roma, Jew and other national minorities will be presented, along with the digital archive of Latvian folklore www.garamantas.lv. More information: lfk.lv. 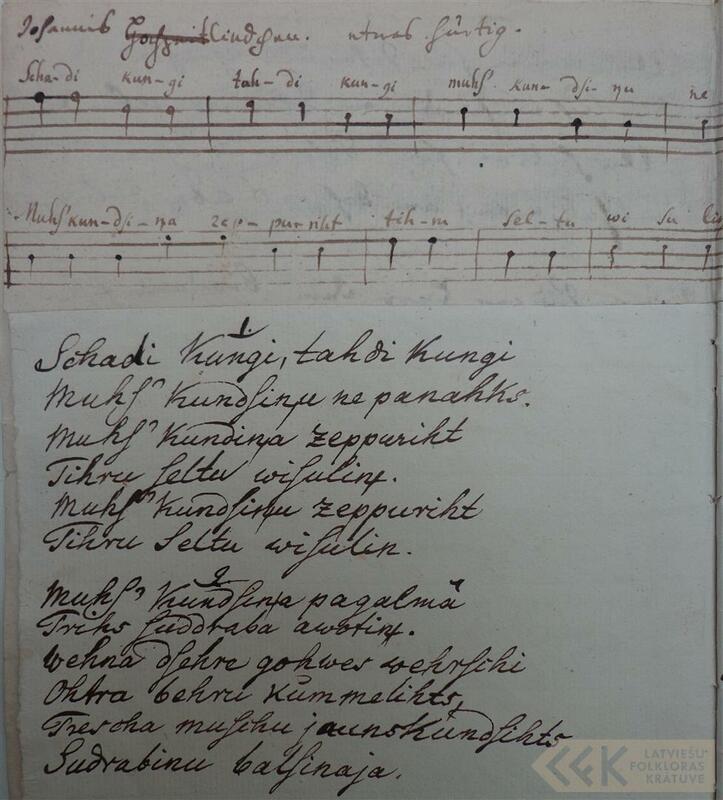 The manuscript of Latvian folksongs and their translations into German, the collection of Johann Gottfried Herder (1744–1803). The manuscript is published in collaboration with Berlin State Library and National Library of Latvia. 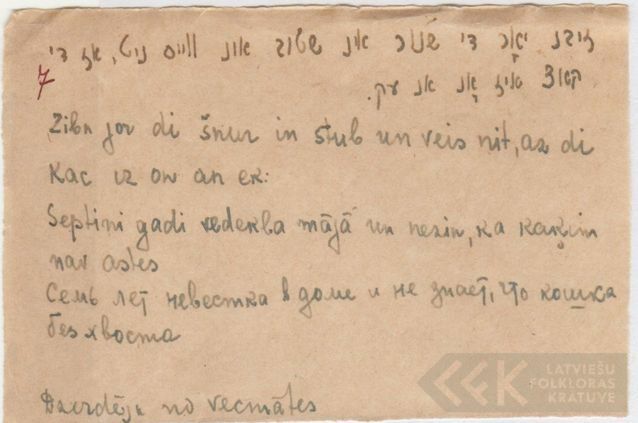 The collection of Latvian Jews' folklore collected by Girša Etkin is added to folklore.lv. Submitted to archives in 1946. In total 500 folklore units, mainly proverbs and sayings. Manuscript . 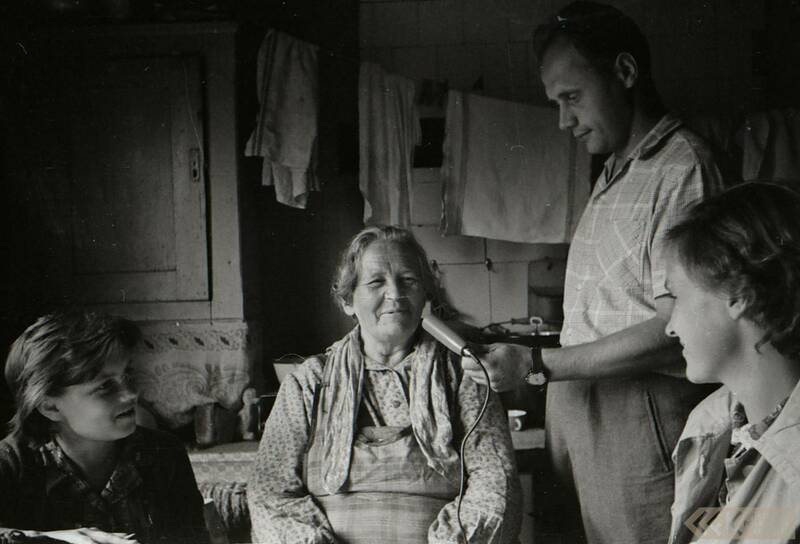 The collection of Latvian Roma folklore collected by Jānis Leimanis included in the database. Manuscript : 500 folklore units, 1094 manuscript images. Roma language materials are provided with interlinear Latvian translation. Folklore collection of Herder Institute in Riga included in the database. Submitted in 1939 by Lutz Mackensen. Languages: German and Estonian. Manuscript . The outstanding collection of Belorusian folklore in Latvia collected by Sergey Saharov is available online in folklore.lv. The collection  includes 2793 folklore units and 787 manuscript images. Folklore materials of Latvian Russians collected by Ivan Fridrih are added to the database. Manuscript : 759 folklore units, 1250 manuscript images. Folklore collection of Dūre Primary School, located near Lejasciems parish in Northern Latvia included in the database. Manuscript , 79 manuscript files. 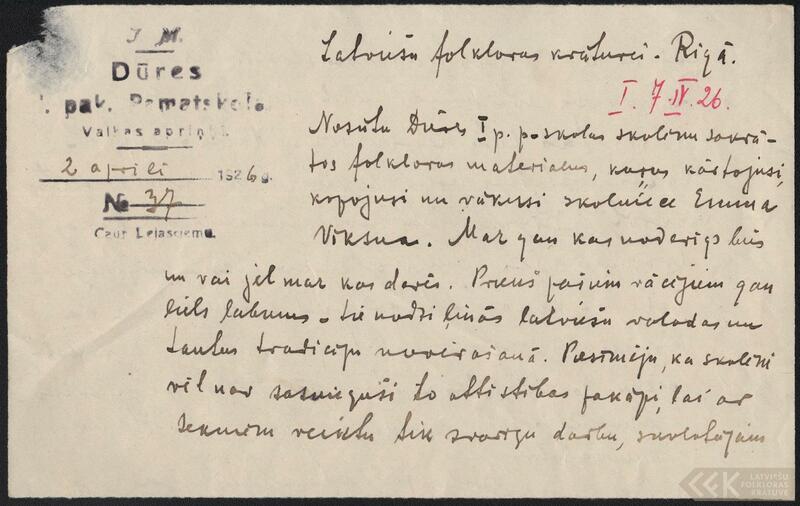 The very first registered manuscript of Archives of Latvian Folklore included in the database. Folklore collection of Mīlītes Primary School in Bauņi parish. Manuscript . Latvian folksong texts and manuscript images of Krišjānis Barons' Cabinet of Folksongs (Dainu skapis) had been added to folklore.lv. Thus the data base is enlarged by 172779 folksong units. The digital version of the Cabinet of Folksongs is available since 2002, see www.dainuskapis.lv. Welcome to the Digital Archives of Latvian folklore! 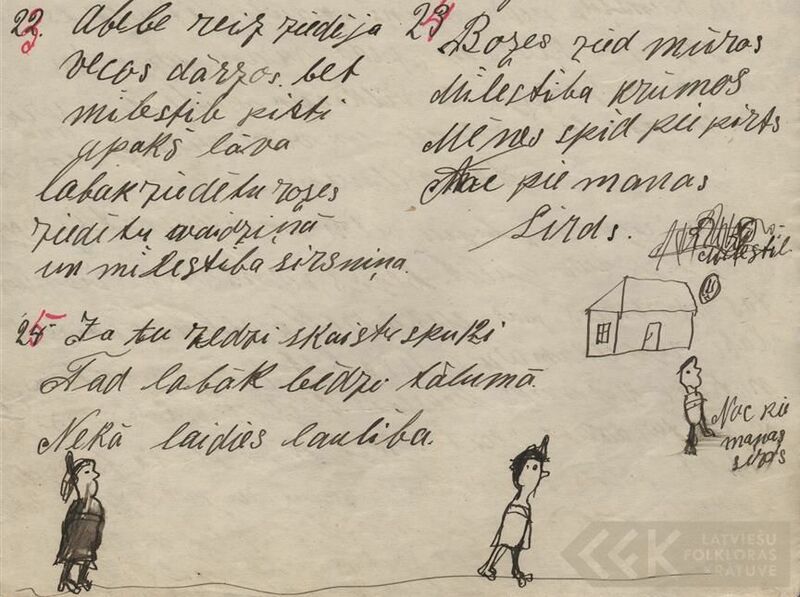 This website provides you with an opportunity to view a material collection of the Archives of Latvian Folklore - collections, illustrations and recordings. You are invited to explore folklore collections, search for persons and places, study folklore genres and help to transcribe! The digital archive is enlarged regularly — follow the news!